George Herman Ruth, (February 6, 1895 – August 16, 1948), better known as Babe Ruth and also commonly known by the nicknames The Bambino and The Sultan of Swat, was an American baseball player and United States national icon. He was one of the first five players elected to the Baseball Hall of Fame and he was the first player to hit over 30, 40 and 50 home runs in one season. His record of 60 home runs in the 1927 season stood for 34 years until it was broken by Roger Maris in 1961. He also was a member of the original American League All-Star team in 1933. In 1998, The Sporting News named Ruth as Number One in its list of "Baseball's 100 Greatest Players." Brother Matthias brought Babe to the attention of Jack Dunn, owner and manager of the minor-league Baltimore Orioles, and the man often credited with discovering him. In 1914 Dunn signed 19-year-old Ruth to pitch for his club, and took him to spring training in Florida, where a strong performance with bat and ball saw him make the club, while his precocious talent and childlike personality saw him nicknamed "Dunn's Babe". On April 22, 1914 "The Babe" pitched his first professional game, a six-hit, 6-0 victory over the Buffalo Bisons, also of the International League. By July 4, the Orioles had a record of 47 wins and 22 losses, 25 games over .500; but their finances were not in such good shape. In 1914 the breakaway Federal League, a rebel major league which would last only 2 years, placed a team in Baltimore, across the street from minor league Orioles, and the competition hit Orioles' attendance significantly. To make ends meet, Dunn was obliged to dispose of his stars for cash, and sold Ruth's contract, with two other players to Joseph Lannin, owner of the Boston Red Sox, for a sum rumored to be between $20,000 and $35,000, although some sources say it was closer to $3000. During spring training the next season, Ruth secured a spot as a starter. Ruth joined a fine pitching staff that included Rube Foster, Dutch Leonard, and a rejuvenated Smokey Joe Wood, and their pitching carried the Red Sox to the pennant. Ruth won 18 games and lost 8, and helped himself with the bat, hitting .315 and slugging his first four major league home runs. The Red Sox won the 1915 World Series, defeating the Philadelphia Phillies 4 games to 1, but because manager Bill Carrigan preferred right-handers, Ruth did not pitch and grounded out in his only at bat. After the 1917 season, in which he hit .325, albeit with limited at bats, it was suggested Ruth might be more valuable in the lineup as an everyday player. In 1918, he began playing in the outfield more and pitching less. His contemporaries thought this was ridiculous; former teammate Tris Speaker speculated the move would shorten Ruth's career, but Ruth himself wanted to hit more and pitch less. In 1918, Ruth batted .300 and led the A.L. in home runs with 11, despite having only 317 at bats, well below the total for an everyday player. He also pitched well, going 13-7 with a 2.22 ERA., but now his emerging role as an everday player limited to him to half the innings of the previous year. Ruth had excelled at the double duty work, and he could make a case as the best player in the 1918 season. Additionally, he led the Red Sox to another World Series, where they met the Chicago Cubs. By 1919, Ruth was basically a fulltime outfielder, pitching in only 17 of the 130 games in which he appeared. He set his first single-season home run record that year, hitting 29 home runs, breaking the previous record of 27 set by Ned Williamson in 1884, in addition to batting .322 and driving in 114 runs. News of his batting feats spread rapidly, and wherever he played large crowds turned out to see him. As his fame spread, so did his waistline. Since his time as an Oriole, teammates had marveled at Ruth's capacity for food, and by 1919 his physique had changed from the tall athletic frame to more of a rotund shape, although Ruth's weight would have wide flucuations until the mid-1920's. Beneath his barrel shaped body, his powerful muscular legs seemed strangely thin, but he was still a capable base-runner and outfielder. His contemporary Ty Cobb, noted for his cruel bench jockeying of Ruth, would later remark that Ruth "ran okay for a fat man." "It would be impossible to start next season with Ruth and have a smooth-working machine. Ruth had become simply impossible, and the Boston club could no longer put up with his eccentricities. I think the Yankees are taking a gamble. While Ruth is undoubtedly the greatest hitter the game has ever seen, he is likewise one of the most selfish and inconsiderate men ever to put on a baseball uniform." From 1920 to 1934, Ruth's tenure as a Yankee, the Boston Red Sox were the worst team in the American League. During this span they finished last 10 times, never finished above 5th place, and they had no winning season until 1935. After they sold Ruth, the Red Sox struggled to win even a single World Series until 2004, contrasted with the Yankees overwhelming success in that venue, led to a superstition that was dubbed the "Curse of the Bambino." Almost immediately, Ruth began to pay off on his investment. He trained extensively over the winter, and in 1920 turned up at spring training in fine condition. When the season started, it was clear that the more hitter-friendly Polo Grounds suited him, and Ruth's 1920 season turned into one that no one had ever come close to seeing before in baseball. He hit 54 home runs, smashing his year-old record, batted .376, and led the league in runs (158), RBI's (137), walks (148), and his slugging average of 847 was a major league record for over 80 years (Barry Bonds eclipsed it with a .863 mark in 2001). Ruth's season was so dominating it led to one of the most amazing statistics in baseball history. In 1920, Ruth out-homered all but one team in baseball, as only the Philadelphia Phillies with 64 hit more home runs than Ruth. Ruth of course was not the only reason more fans were coming to the ballpark. Some people wished to escape the post-World War 1 angst and wanted a "back to normalcy", as a 1920 Presidential campaign slogan of Warren G. Harding put it. The dramatic increase in home runs and scoring was also getting fans attention. These and other reasons were factors, but it is no coincidence that the 1920 Yankees, Ruth's first year as a Yankee, shattered the major league attendance mark. The Yankees drew nearly 1.3 million fans, breaking the old mark of the 1908 New York Giants by nearly 400,000 fans. Attendance dramatically increased in every major league city in 1920, and seven teams set their own attendance records. The attention Ruth generated for the game, with all his home runs, playing in New York, his personality, and even his off the field activities (some not always positive) was bringing an unprecended spotlight to baseball. Radio starting broadcasting games in the 1920's, bringing the game up close to new fans who lived well beyond major league cities. Baseball still had its problems: a segregated game, competitive imbalance, and owners with complete control over the players, but the popularity of the game increased so much that the 1920's has often been called baseball's first Golden Age, and Babe Ruth can justifiably be given a large share of the credit. Ruth' home runs were at the epicenter of an explosion of offense in baseball. In 1918, the major league batting average was .254, in 1921 it was .291; the league ERA went from 2.77 to 4.02, runs increased 25% and home runs increased 300% over the same time span. Almost overnight, baseball had gone from the most anemic hitting era in baseball history (the dead-ball era) to what would be the greatest hitting era, the 1920's. A few factors have been cited for the dramatic increase in offense. One major reason was baseball outlawed (with some exceptions) the spitball pitch in 1920, and the next year it banned the emery (scuffed) pitch. The spitball was a devestating pitch to the batter, as it gave a pitcher great movement on the ball, especially downward. Another factor was the league mandate to regularly replace the baseball during a game. Previously, the same discolored, tobacco stained ball was used over and over until it was literally falling apart. The overused ball would lose its resiliency making it much more difficult to hit home runs. The impetus for this change was the death of Ray Chapman in 1920, who was killed when he was hit on the head with a dirty, darkened pitched ball that he apparently lost in the background on an overcast day. Another reason given for the increase in home runs was that more players were emulating Ruth's full free swing. Before, batters were largely content to choke up on the bat and protect the plate. 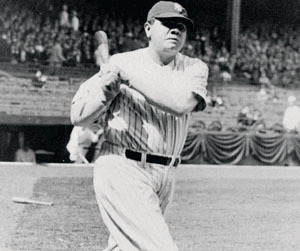 With his swing, Ruth had shown it was possible to hit a prodigious amount of home runs, and more players started to swing for fences. With the home run now a weapon, more managers lessened their previous absolute control of the offense, and they started to play for the big inning by giving players more freedom to swing away. By 1921, stolen bases were half the total from just a few years earlier, and the use of the sacrifice and hit and run, additional overused strategies during the dead-ball era, also decreased. Skeptical of the new offensive in the game, some baseball writers of the time claimed the baseball was livened (usually done by winding it tighter, or changing the cork center, or both). This assertion even became accepted as a fact over time, even though there was no scientific evidence the ball was changed. One study in in August of 1920 confirmed the ball was the same as previous years, and early in 1921, also hearing rumors about the juiced ball, National League President John Heydler launched his own investigation and also concluded the ball was no different. Heydler's findings stated the outlawing of the spitball was the predominant factor for the increased scoring. Those who claimed the ball was livened may have not had hard evidence, but they may have had history and statistics on their side, as never in baseball history had there been such a quantum jump in offense over such a short time.